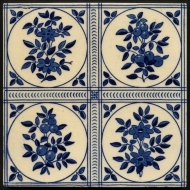 Blue and white was popular for pictorial tiles but relatively few floral, foliate and geometric blue and white tiles were made. They tended to be made by companies who also made tableware like Mintons China Works and Josiah Wedgwood & Sons. They are less often found in fireplaces and more often in dining room furniture and pot stand/trivets to compliment the tableware. 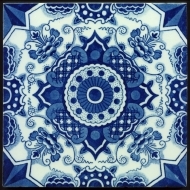 There were various shades of blue used, the more popular 'flow blue' prints are usually less sharp than black or brown as the blue diffuses in to the covering glaze somewhat, this diffusion was originally considered a manufacturing imperfection but the beauty of the colour and the softening effect more than compensate. Mintons stated on their catalogue page illustrating blue tiles, 'The colour represented here is Indian Blue on white tiles, but the same patterns are also done ... in a rather clearer blue called F Blue". We can't be sure which name refers to which colour, indeed variations in material constituents of stain and glaze, and in firing conditions, produced a range of shades of blue. Furthermore 'clearer' can be interpreted as a more translucent blue or giving a crisper print. To further compound matters descriptions of shades of blue vary over time especially when new shades are consistently obtained. Natural Indian Blue (or indigo) would burn off in the kiln so Mintons Indian Blue would have been a more stable mixture of chemicals made to match the colour. It is however presumed that the most common blue found is India Blue due to the preeminence it was given in the catalogue. Blue is the most problematic of colours to get a good image of due to the lighting conditions we experience, daylight has much more blue in it than electric lighting. Our eyes automatically adjust to a great extent so we recohnise the same colours but blue items look richer in daylight than incandescent light (normal electric lighting). Imaging devices like cameras and scanners are usually designed to simulate daylight conditions - taking an indoor photograph with flash and without flash well demonstrates the difference.